Data Science projects are either pure analytics projects, or Software projects, or both. There are two other steps which I left out as I don't have any rules to follow or tools that simplify the job: Getting access to the data and data cleaning. Please also note that waterfall does not work: The project phases are likely not "pure", but slightly mixed. While you will have an exploratory phase in the beginning, you will also need to communicate your findings (story telling). In the following, I will highlight some of the tools to simplify the project phases and mention what you should do to make the project successful. Before there is Data, you have a proces which generates the data. You have a business with a history. Changes which needed to be done. Not the nice and clean way, but ASAP. Understanding how the setting helps you to ask reasonable questions in the next step. Exploratory Data Analysis happens when you first get a dataset and already have it in a format you can work with. The linked article already contains quite a bit of software, especially Pandas, Ipython notebooks and edapy are useful at this step. No tests: What exactly would you test for? The only thing I could think of is boundary and distribution checks, e.g. defining that an "age" has to be non-negative and below 200 and should have its median between 20 and 40. No reviews: It is super hard to review IPython notebooks. Don't get me wrong - you should talk about your findings and you should give co-workers access to your code, but it does not make sense to expect them to fully go through your code. Code for understanding data is likely dirty, because most data is dirty. It's hard to tell when this project phase is over. One artifact that should be created at the end of this project phase is a data loading script. It should take the data from your typical sources and return it in a format you can directly work with. This could be CSV to Pandas dataframes. The dataframe should be cleaned already. The data loading script will be pasted in the subsequent software project and should get a software review as it is a core part of the software development. If you happen to be in a pure exporatory project - meaning somebody told you to have a look in the data and find interesting things - be aware that this is hard. Make clear that stakeholders understand that you need regular feedback to see if you are on the right track. I would say at least once a day. Pure EDA projects have a high potential to be unsatisfying for everybody. Ask Stakeholders for Hypotheses. Hypothesis checking is a lot more "work as usual" where you can build up knowledge and finish the task. 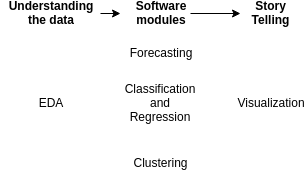 For forecasting, classification and regression you are in a supervised machine learning tasks. As it is machine learning, you have to have an optimization metric. In some cases it will be possible to have the same optimization metric as what your stakeholders use to measure how well this part is doing. If this is possible, do it: Use the same metric! Having the same metric to optimize likely leads to better results and gives your stakeholders an easier time understanding your results. It directly contributes to the "story telling" aspect. As with any software project, you should have tests, code reviews, a proper project structure and get deployed / used somewhere. Data Scientists understand their models: We wrote them. There is no way to create a complex piece of software that works without understanding it. Black Boxes are common: If we define a black box as something where we don't know 100% instantly and intuitively what happens, then there are a lot of black boxes. Humans, for example. But still you trust your doctor. Error types are important: For a human doctor, you know in which way he might do errors. He might be psychologically ill, most likely he will just not pay enough attention and thus diagnose something common where you might have an issue which is uncommon. For machine learning models, it can be the other way around. While overfitting is a problem we are aware of, the model can be fooled to make a very unusual prediction. So there are two sides of this problem: On the one hand, it is hard to make sure that a model is trustworthy. You have to have the right metric(s), you have to make sure the software works as expected. On the other hand, if you have a trustworthy model, you have to convince your stakeholders that it is trustworthy. For this part, you have to talk a lot with your stakeholders. They have to get a basic understanding how your model works. It is especially important to emphasize that a model is not a rule-based system. At least not necessarily. Decisions can be made in a non-linear way which makes questions such as "what is the most important feature" problematic. You can build trust by giving access to your model. If you can give your stakeholders an easy to use interface in which they can enter / manipulate features and see the output of a model, they will either build more trust in your model or you will get some examples where your model fails. Either way, it is a win for the project. 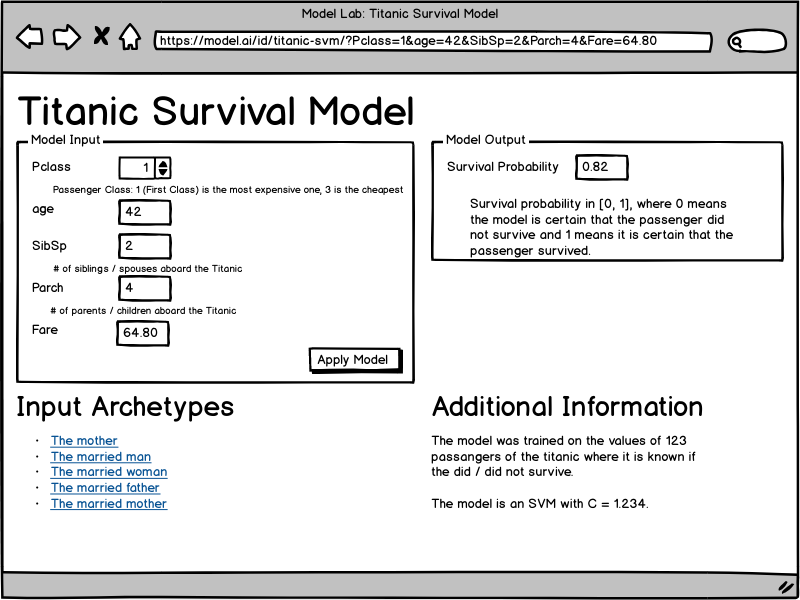 This wireframe is an idea for a web service which allows data scientists to share models with stakeholders in a way that they can "poke" it. They see what the input of the model is, they can manipulate the input and see the output. Please also note that the URL contains the models parameters and thus can be shared. How can such a web service look from a software perspective? "comment": "Passenger Class: 1 (First Class) is the most expensive one, 3 is the cheapest"
"comment": "# of siblings / spouses aboard the Titanic"
"comment": "# of parents / children aboard the Titanic"
"comment": "Survival probability in [0, 1], where 0 means the model is certain that the passenger did not survive and 1 means it is certain that the passenger survived." "text": "The model was trained on the values of 123 passangers of the titanic where it is known if the did / did not survive.\n\nThe model is an SVM with C = 1.234." Story Telling is the part where you, as a data scientist, make your insights accessible, easy to understand and interpret in the correct way by your stakeholders. It can be about visualizations, but also about choosing the right metrics and reasonable numbers to share. I think I'll make another blog post about this topic as Python has many visualization packages.